Gorgeous House, 4 Bedrooms and Loft, 3.25 Baths, Sleeps 14! 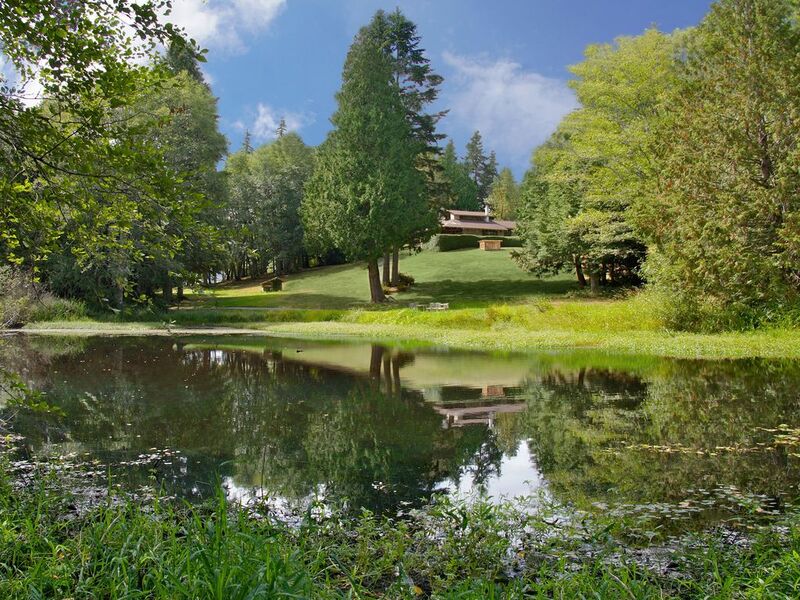 Kingston House is 27 acres of rolling lawns, gardens, lavender farm, woods, a pond, and a grand mid-century home of douglas-fir and stone designed by Anker I. Molver. Neither pretentious nor rustic, it is a quintessential Pacific Northwest setting for your celebration or weekend getaway. Conveniently situated between Bainbridge Island and the Olympic Peninsula, Kingston House is an ideal setting for your family retreat or special getaway. We're 5 mins. to the Kingston-Edmonds ferry and 20 mins. to Bainbridge Island. In fall 2018, a new passenger ferry will whisk passengers from downtown Seattle to Kingston in 33 minutes! Kingston House is nearly 4,000 sq ft (372 sqm) of spectacular Pacific Northwest architecture. The great room features vaulted ceilings, hardwood, slate and bluestone floors, and a conversational area with a huge wrap-around river rock fireplace to relax and enjoy satellite HDTV or the DVD / Stereo unit. The fully-equipped kitchen includes a six-burner Viking gas stove, two ovens, a microwave, food warmer, one large refrigerator plus a smaller one in the pantry, as well as two dishwashers. Kingston House features a total of seven beds: 4 in each of the four bedrooms, and 3 in the Loft. The luxurious Madrona Suite has a private entrance, bathroom, hot tub and laundry room. All bedrooms open directly to a large patio with beautiful views of the flower gardens, expansive lawns and pond. The House features a total of 3.25 bathrooms. Kingston House’s grounds are spectacular. Wide expanses of lawn and groves of evergreen and deciduous trees cover 15 acres of rolling hills. Gravel nature paths wrap around a large pond popular with ducks, geese, Great Blue Herons, deer and occasional coyote. Enjoy dinner on the expansive waterfall patio or indulge in a late night dip in the outdoor jetted soaking tub (April-October only). This listing is for Lodging inquiries only. A separate Events fee is required for weddings, receptions or other events. The owner lives on-site in a separate apartment. Thank you! My mother purchased Kingston House in 2003. I purchased the adjacent properties in 2014. Today, we are creating a public garden and event venue and look forward to sharing it with you. 3.25 baths: 2 full bath, 1 - 3/4 bath & 1 powder room (1/2 bath). Founded in 1853 as a lumber town, today's quaint Kingston is the gateway to Washington State’s beautiful Kitsap and Olympic peninsulas. The property includes a large pond with walking trails. The White Horse Golf Course is located nearby. Public tennis courts are located about 1.5 miles away. White Horse Golf Course is near by. Smoking is allowed on the outdoor brick patio. For full details about our wedding packages, please visit our website, www.kingston.house. A unique and amazing spot for families! Thank you for a perfect weekend getaway for our family. Our extended family had an epic retreat on this amazing property. The house is amazing with 4 full bedrooms plus s loft sleeping. We spent hours around the big fireplace playing games and music. The trails around the property were great for our dogs, we even took the canoe out on the pond. Matt was terrific,very responsive. He checked in to ensure all was going well. My only recommendation is a few good cooking pots with matching lids. The gas range is top notch, it would beneficial to have great cookware. The dining room is the perfect gathering spot. The master suite is a dream! Thank you so much for your kind words! You and your family were the perfect guests - friendly, easy to communicate with, and you took wonderful care of the house and grounds. We are so glad that Kingston House was a great fit for your family to close out 2018 and to welcome in the New Year. Best to all of you in 2019! We hope to see you again. My family and I had stayed at the Kingston House over July 4th weekend and had a wonderful time. The house is beyond stunning and the property breathtaking. My daughter and her friend, and our Aussie, had a fabulous time exploring the grounds and spent hours outside the lush, well-maintained, and vast property playing frisbee, catch, and other games. The house had all one would want for a stress free family vacation. It was clean, beautifully decorated, completely stocked, had luxurious amenities, and was quiet and serene. We explored nearby Kingston Waterfront park for the farmers market and July 4th parade. We also drove to nearby downtown Poulsbo which is a very charming town with nice galleries and restaurants. We bought a painting and had a nice dinner. We were also excited to return to the home and relax as it was so peaceful. We built a fire and sat around the fire late into the evening. The owner/manager is extremely nice and accommodating. She offered ideas and suggestions for things to do and was very accessible for anything we needed. Communication was great and instructions were easy to follow and understand. We have previously stayed at another of the owner's property on Bainbridge Island and were just as satisfied and pleased. I would not hesitate to stay at her properties again in the future and will likely do so!!!! Thank you for your kind words! :) It was so nice having you stay at Kingston House this year! As always, it's wonderful to hear that our guests have enjoyed their stay at one of our vacation rentals. We hope to see you and your family again next year! Arrived here in the first week of January for a much needed relaxing weekend. Stayed with a group of girlfriends, 7 to be exact. There is tons of room here. The yard is gigantic. Great for a get-away of playing cards, drinking wine, reading and talking. Highly recommended, you won't regret it! Thank you so much, Sonja. We are glad you and your friends enjoyed Kingston House and were able to get some rest and relaxation here. We look forward to seeing you again! Previously I stayed at another property belonging to the owner and since I had a wonderful time in the fall. I decided to try this rental property for a change of scenery. Sycamore Hills exceeded my expectations! From the lush landscape to the spacious home, I truly wished this was my home all year! If you are looking for a great place to have a family vacation or retreat, I highly recommend it! There is a pond on the property and walking trail, I spent morning coffee on the wraparound deck. It was a much needed relaxing vacation. Also, if you are bringing a large family or group, there are plenty of bedrooms...which can be hard to find with some rental properties. This property is also tucked away from the main road which has great access to shopping, dining and the ferry. Thank you so much for your kind review! It was wonderful to have you staying again at one of our properties. We hope you have a wonderful 2013 and hope to see you again! We felt so rejuvenated by the incredible natural setting!!! Thank you for the wonderful time in the peaceful and tranquil Sycamore Retreat! We felt so rejuvenated by the incredible natural setting, the morning light reflecting on the pond and not to mention the gorgeous home... We loved the feeling that we were far from civilization, and yet, we also appreciated being a couple of minutes from the Kingston Farmers Market, waterfront, marina and Kingston ferry and other conveniences! Sycamore is truly a special place and we will be back! Thanks for being so easy and fun to work with, Kinam!